make your own: compound butter. – Reading My Tea Leaves – Slow, simple, sustainable living. Compound butter sounds fancier than it really is. It’s butter, softened, with herbs or fruit or other bits of tastiness stirred in. 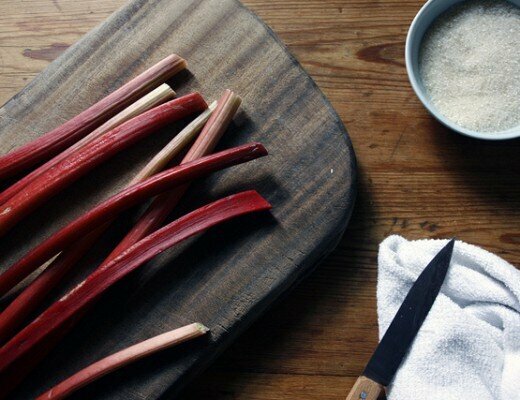 You can shape it into a log, chill it, and serve it in rounds on bread and butter plates. 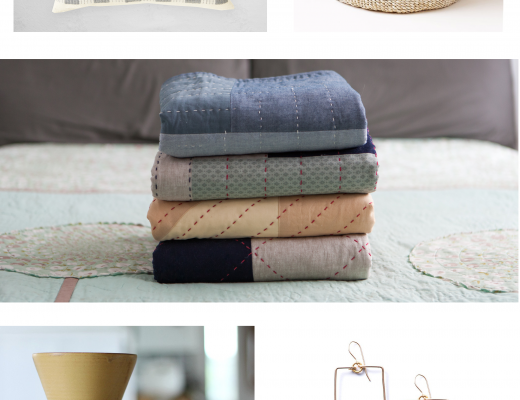 Or, you fill up a jar and tie on a ribbon it becomes a homespun gift for a host. 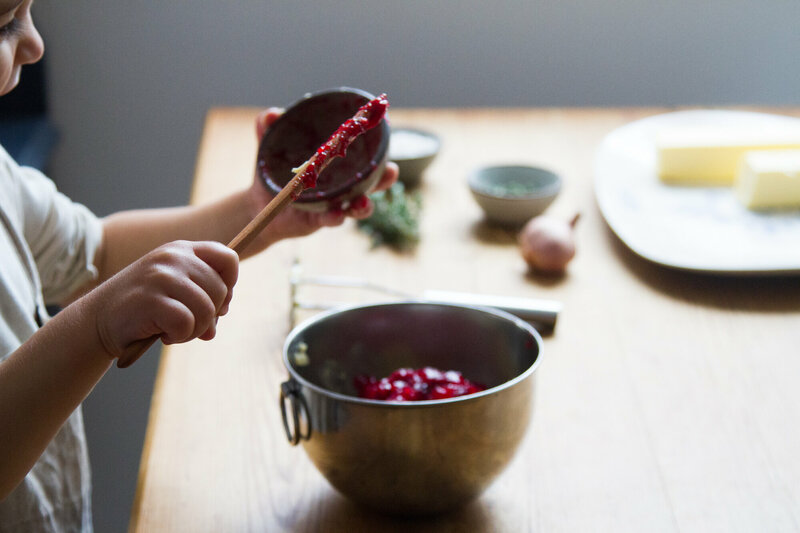 Last week, we made two different kinds—one with cranberries and one with shallots and thyme—to serve with slabs of already buttery brioche at a Pre-K breakfast. (‘Tis the season for indulgence, and I’ve yet to met a preschooler who doesn’t clamor for pink.) Since then, we’ve been putting it on the breakfast table every morning. If you’ve got leftover herbs or a container of cranberry sauce destined to be forgotten, consider this an opportunity to put them to good use. Allow the butter to soften at room temp until quite smushable (the technical term). 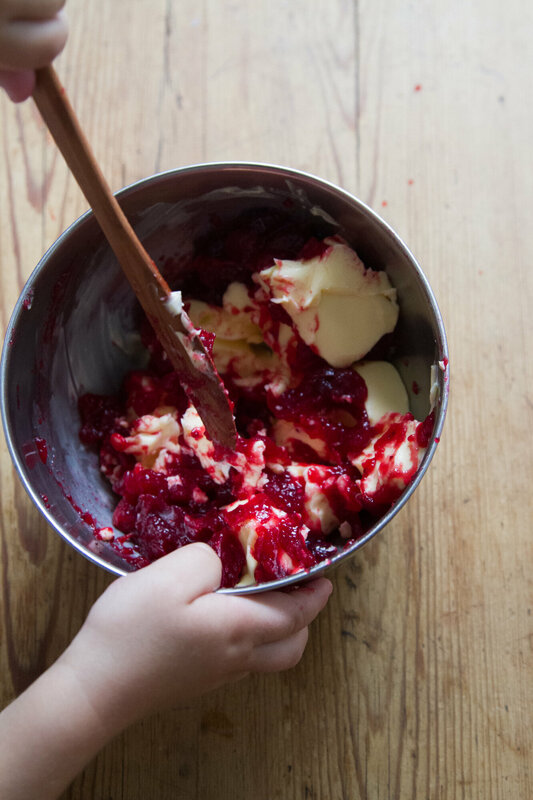 Spoon cranberry sauce into a bowl with softened butter and beat with the back of a wooden spoon or, as we did, a potato masher, until very well incorporated. Once well-mixed, you can reshape your butter into a log with a bit of wax paper, or simply spoon it into individual bowls or jars. Once again, allow the butter to soften at room temp until very smushy. 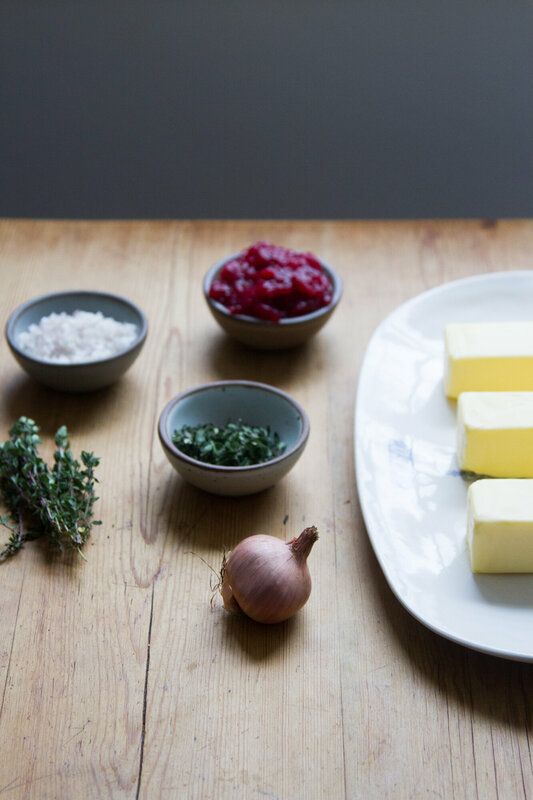 Combine butter, herbs, and shallot into a small bowl. As above, beat with the back of a wooden spoon or a potato masher, until very well incorporated. Here too, you can reshape your butter into a log with a bit of wax paper, or spoon into individual bowls or jars. 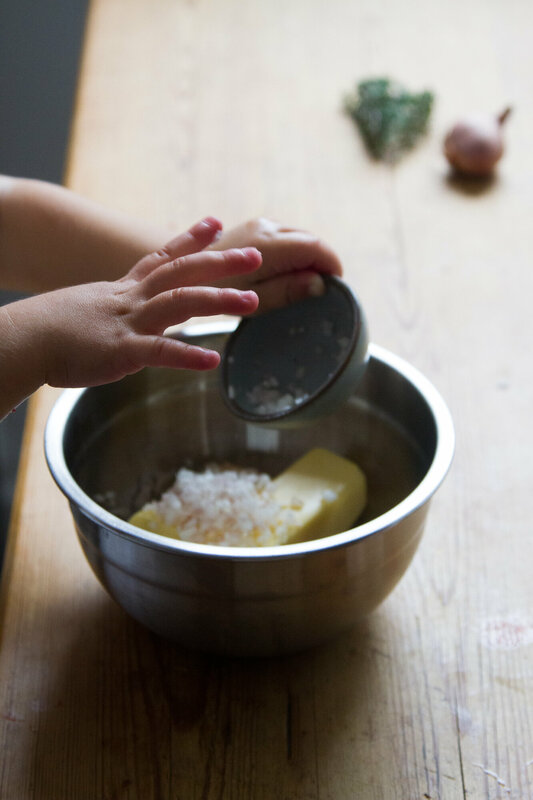 If you convince your toddler to wash his hands thoroughly first, compound butter is a very excellent thing to make with an eager kitchen helper. A food processor will make quick work of the task, but not having one is no reason to skip the project. Consider swirling together the softened butter and herbs a meditative act. 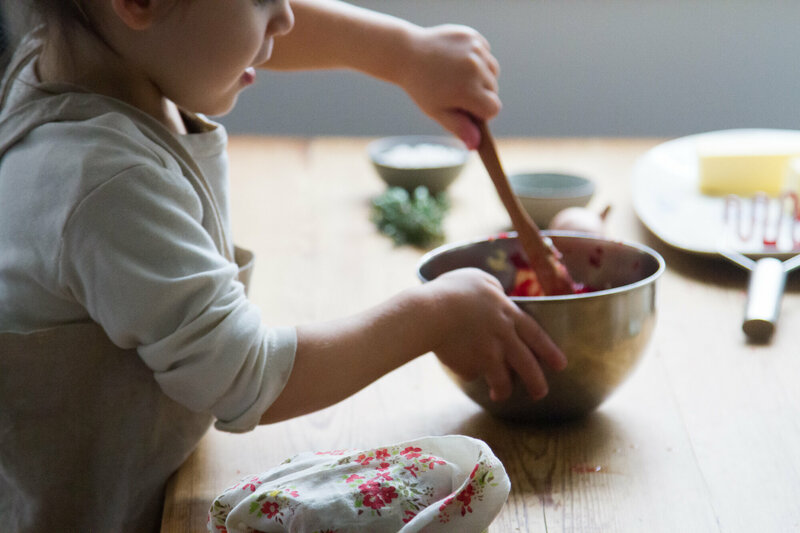 Skip the mindfullness app, and spend a few minutes methodically scraping down the sides of your buttery bowl until the herbs or fruit are incorporated. Reward yourself with a slice of toast and smear of more-delicous-than-usual butter. Silas’s beautiful mise-en-place is courtesy of East Fork Pottery Bitty Bowls, which we’ve found to be handy and lovely for all manner of tiny things. 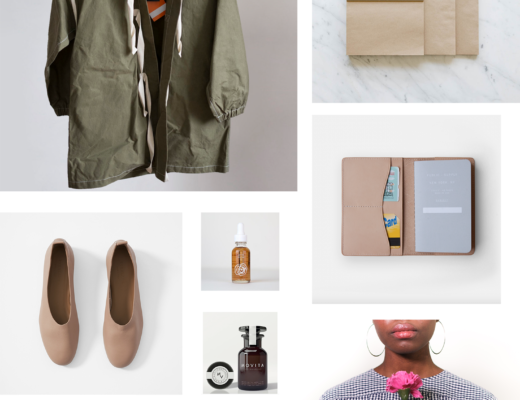 If you’re looking for very sweet gifts for yourself loved ones, you’re in luck. Use the code TEALEAVES for 20% off Bitty Bowls. Offer expires December 26, 2018. Silas’s apron was a gift from Rough Linen. More on the great usefulness of Bonne Maman jars. I’ve never tried cranberry butter before but it sure looks delicious. I’m vegan, and make compound “cream” cheeses: mostly starting with Trader joes vegan cream cheese or Tofutti cream cheese. My current favorite is caper, fresh dill, finely minced red onion, pureed carrot, nutritional yeast and some liquid smoke to make lox spread. It is really tasty. But the same idea with your butters. I like pumpkin cream cheese with hemp seed. I tried one with pomegranate molasses and arils, but that was a flop. yes! sounds delicious…but noted about that flop! We are vegan too and love Myokos butter. It reminds me of my Oma’s sweet cream butter I had as a child. Mims your recipes sound yummy! Thanks! Can’t believe I was a cheese and butter addict years ago. First year without dairy products and it was one of the most impactful and changing resolutions of my life (I was vegetarian for years). Don’t want to sound boring telling my story but apart from the ethical obvious reasons, it had a big impact in my health. Goodbye sciatic pain! Wouldn’t 1.5 sticks of butter be 12 tablespoons (8 tablespoons per stick)? More like checking my math 😉 Whoops! Edited! I am trying to convert my family to more earth friendly/zero waste and have 2 teenagers. If you could think of some things that would appeal for that age I would love it. We have talked about reducing plastic and they are on board-ish but it is hard! Ariana from https://instagram.com/paris_to_go?utm_source=ig_profile_share&igshid=1pea5ptyi45mg Paris to go is such a cool gal that I think she will appeal to teenagers! She is in Namibya right now. Also, never think that they are a lost case or don’t care, from my experience with family, friends, etc some of those who don’t pick up greener habits right away end up returning to them later in life, while young adults etc because they have memories around it with their parents. Just keep doing how you like and they’ll pick up sooner or later! There’s something called “Fromage Forte” that I heard about in Tamar Adler’s “An Everlasting Meal.” It’s basically any odds and ends of cheese in the fridge, all mixed up. Hard cheeses and even rinds get grated, and you smush everything together with about one part soft butter to three parts cheese. Sometimes I add a glug of wine, or chopped herbs, or garlic. Sometimes I broil it on little toasts, or we spread it on crackers or celery. That’s how we clean out our cheese drawer! And if you don’t have enough cheese, add more soft butter. This has saved me when I have unexpected guests and all our little bits of cheese don’t look appetizing on their own. Hi! I have a question. What do your kids stand on to reach the counter? 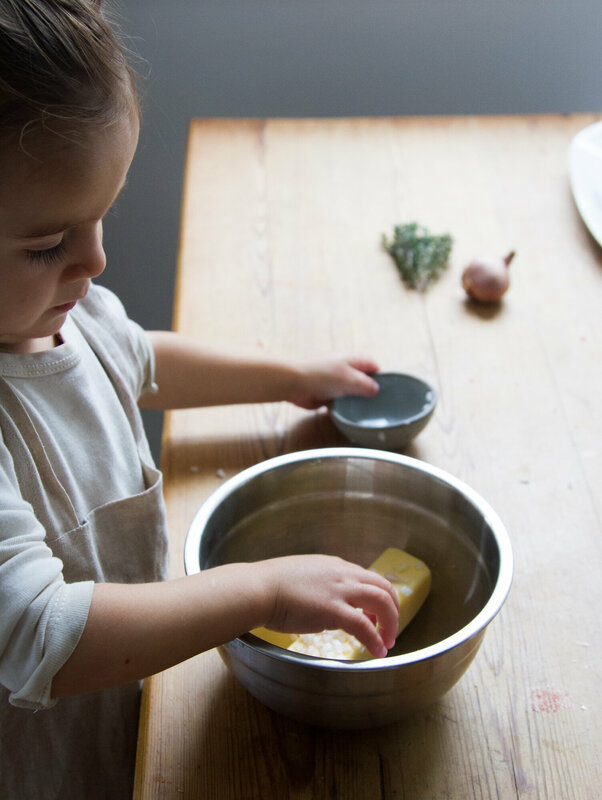 I want to encourage my toddler to help with the cooking but I haven’t found a great solution yet. Our chairs aren’t sturdy, and our stools aren’t tall enough. My friends rave about those “kitchen helper” things, but I’m hoping to make do with what we have. Would appreciate any thoughts!